This is more than your typical "what's your favorite food" post. What kinds of food did you eat growing up? Do you still eat it now? If you ate any cultural foods, what did you eat? Tell us about it! People always ask about your favorite food, but this post is meant to be more than that! You can tell me what your favorite food is, and if you do, tell us why or how it became your favorite food. It can be a specific dish or a certain type of food, like Mexican or Russian food. If you grew up eating cultural food, whether of the country you live in or wherever you trace your ethnic background to, do you like that type of food? What kinds of food did you eat? Tell us all about it! Growing up, I mostly ate Filipino food. If you're not Filipino, you're probably thinking of Lumpia (egg rolls) or Pancit (noodles), and although I ate all that growing up, it's more reserved for parties instead of daily meals. If I wasn't eating Filipino food? Well, I was still eating rice with it! Other than burgers or if we were at a restaurant, my mom made my sister and I eat rice with everything, whether it was bacon, steaks, or fried chicken. The two have very different names but seem very similar according to the English translation, but there are, in fact, a few differences. The biggest difference is that sinampalukang uses tamarind leaves and ginger, while the sinigang is just a tamarind-based stew. And the words at the end of each stew are the types of meat used in it. Baka is beef, and manok is chicken. If you change the meat, then the stew changes too in smell and taste, like if you use hipon (hee-pon // shrimp) or isda (eess-dah // fish). This is what Sinampalukang basically looks like. Other Filipino dishes I ate growing up include (but aren't limited to): balut (bah-lohht // unhatched duck egg // yes I know what you're thinking), lechon (leh-chohhn // whole roasted pig // yes I still know what you're thinking), menudo (this one is slightly different than the Mexican version), and one of my favorites: my mom's famous Filipino spaghetti. I decided to explain Filipino spaghetti for a bit because I know it confuses people whenever they hear about it for the first time because they wonder what makes it "Filipino?" Well, let me tell you. It is all because of one main ingredient: banana ketchup. There was a shortage of tomatoes in World War II, and the next fruit with the highest production in the Philippines at that time was the banana. Because of that, banana ketchup was born! 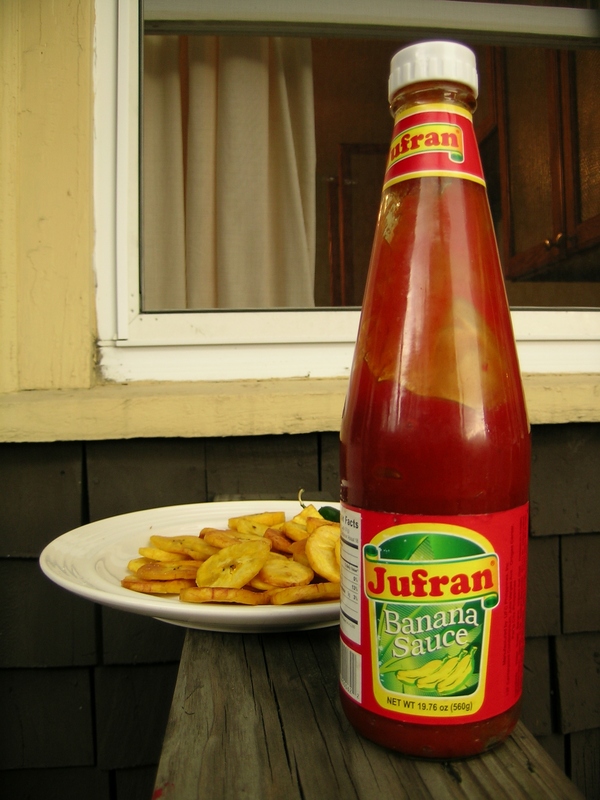 Banana ketchup is dyed red since that is the color of ketchup that people are accustomed to seeing. If you want to get an idea of how it tastes, it's a little sweeter than regular ketchup, but there's a nice kick to it. It's not spicy, but you can taste the spices in the ketchup, hence the kick. Back to Filipino spaghetti: So banana ketchup is usually mixed with tomato sauce (at least that's how my mom does it) to create the sauce for Filipino spaghetti. Instead of meatballs, we just use ground beef and mix it in with the spaghetti. Some people also add extras, like Filipino hotdogs (only difference is that they're red), grilled onions, or mushrooms, but you can also keep it simple with just the spaghetti, the sauce, and the meat, the way my mom does it. I basically eat anything I ate back then today. Two notable dishes that I don't eat anymore/don't prefer to eat anymore are menudo and liver. Menudo was something I loved to eat as a kid, and if you don't know what menudo is in the Mexican or Filipino culture, Wikipedia (I know I hate to cite this as a source, but it's basic information) briefly explains the Filipino version. Now that I'm older, I just grew out of eating it. I can eat it if there's nothing else to eat, but I just don't prefer it anymore. It's not that I don't like it, I just prefer eating other things over it. And as far as liver goes... it should be pretty self-explanatory as to why I don't eat it anymore. My mom made me eat it growing up and while I could tolerate it then, I HATE it now. It's disgusting. And I sure hope you know that I'm talking about liver of a cow or a pig when I talk about liver. I'm not a cannibal, I promise. I could talk about food forever, but I'll stop right here and probably talk more about it in the future if you're interested in learning more about it. I wouldn't mind sharing more educational food posts! So unfortunately, due to a busy schedule, Hoda will not be co-hosting this blog hop with me anymore. However, I do still recommend visiting her blog and checking her out! The rules of this blog hop will change to reflect that change. 1. Respond to the prompt of the week, sharing as much or as little as you feel comfortable! I encourage using photos and would love to see photos integrated in your posts! 2. Link up! (Make sure you are linking your blog post, rather than your blog) using the widget below. 3. I encourage you to read and leave comments for everyone’s posts, but I only require you to do so for at least one person who linked up! 4. Follow your host (me!) on Bloglovin'. It's not required to follow me anywhere else but you totally can if you'd like. 5. As an added bonus, I will retweet/share any of your social media posts that you follow and tag me in (Twitter: @krisellerhiax) (Facebook: Livin' and Lovin' - You may have to post your blog link/facebook post to my wall if you'd like me to see it). 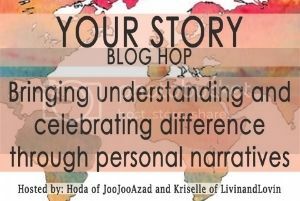 Don’t forget to use the hashtag #yourstorybloghop! This week's link-up will be ending a little later than usual--Tuesday, July 1st at 12 noon PST to give more time to post and link up! I'm looking forward to reading your posts! This is a really neat post! Love learning about different heritages, food in particular haha. That definitely sounds like an interesting spaghetti. I'd love to try it sometime. Those dishes seem so different and I'd love to try them!! I love trying different styles of food! Wow, this is awesome. I think I need to try some of this banana ketchup! One of my goals on my 101 things in 1001 Days is to cook a recipe from 15 different countries. Any suggestions for a fool-proof recipe from the Philippines? ;-) I love learning about different cultures, particularly about food in other cultures. June Sponsor Spotlight: Raewyn + Lauren! Getting Lei-d at Graduation // Giveaway Winners! Ask Me Anything + Another GIVEAWAY!